Although a couple of the OMs (S1 and S2) are away for the summer, we were still able to get together at J’s home on Wednesday. 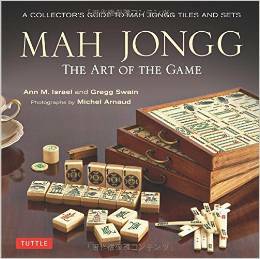 She made a wonderful lunch – gazpacho and a delicious chicken salad – and then we were off and running with many Mah Jongg games. After the Charleston my hand looked just like this…I knew as soon as I exposed one of my Kongs that no one would throw out any more Winds and I had to pray that I would pick the Winds myself or else get lucky with Jokers. 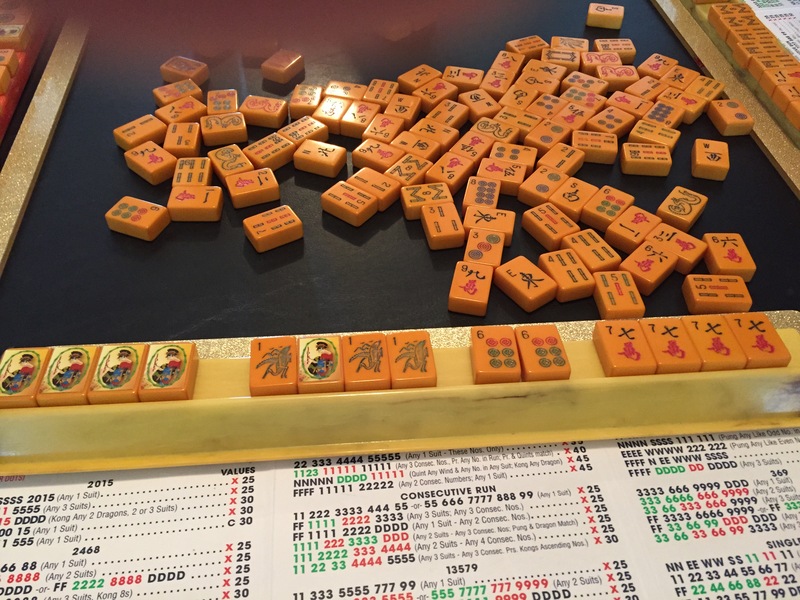 As luck would have it, I did pick up a couple of Jokers and, because it was fairly early in the game, J held her breath and hoped that I wouldn’t be able to pick up an East…lucky me, out it came…I called for it and was able to declare Mah Jongg with the WINDS & DRAGONS hand of NNNN EEEE WWWW SS! K won the next game with a beauty of a Quints hand with NNNNN DDDD 22222. At the beginning of a new game my hand was shaping up nicely after the Charleston. There was no question that I should play the 2468 hand of FF 2222 8888 DDDD but would I be able to pull it off? Mid-game I was still feeling pretty good… …until X declared Mah Jongg with this CONSECUTIVE RUN hand of FF 1111 2222 3333 (the last 3 Dot was cut off in the photo – sorry about that!). 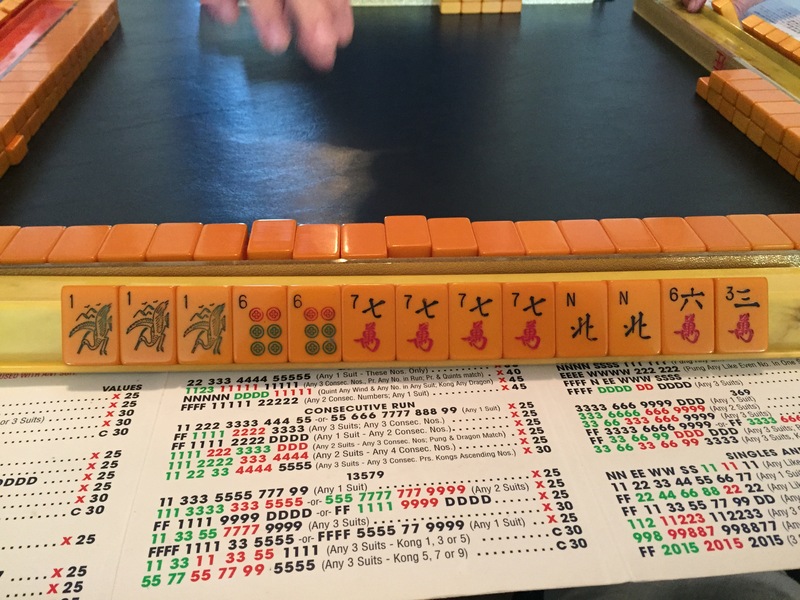 Here you can see that I was happy to declare Mah Jongg with a SEVEN HANDS win of FFFF 3333 44 7777 in this game. 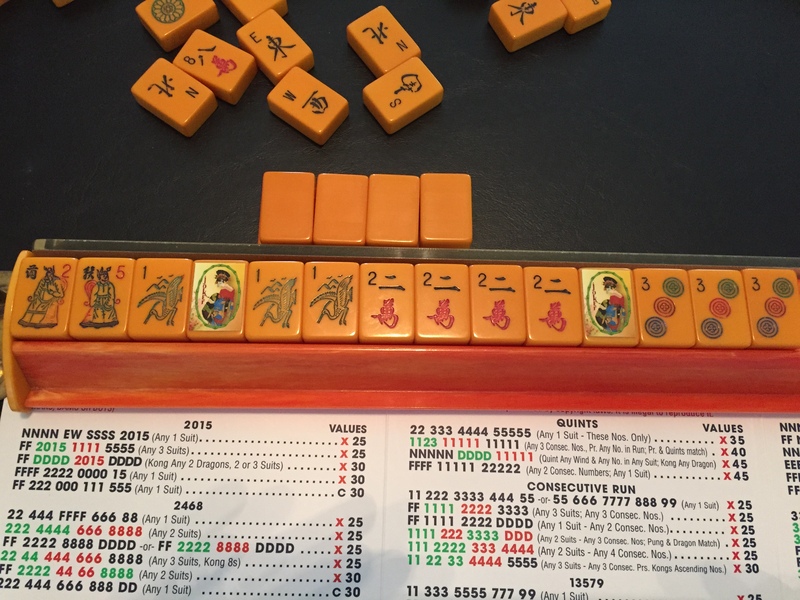 With yet another game starting and the Charleston ended, I found myself looking at what could only be another SEVEN HANDS…but would I be able to collect four FLOWERS to win since I had none to start and also didn’t have any Jokers? 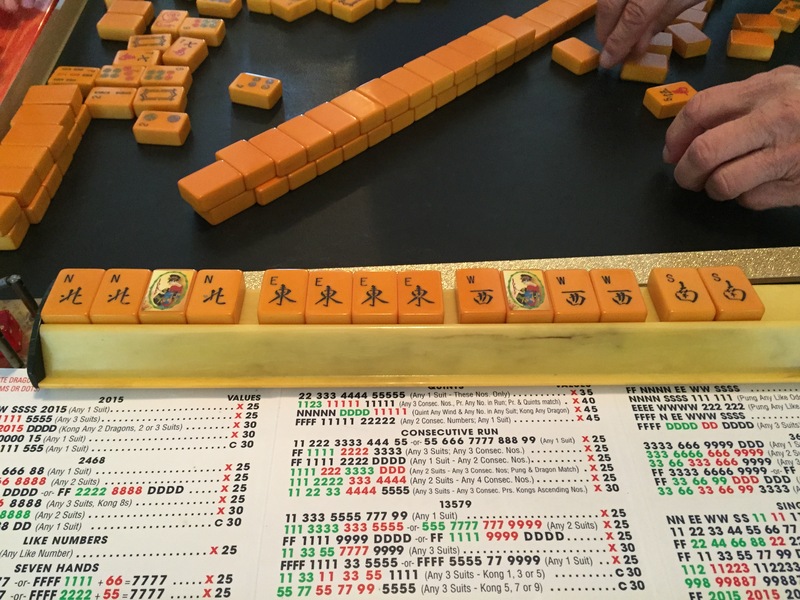 Lucky, lucky, lucky – look at all those Jokers I picked up to allow me to declare Mah Jongg with a SEVEN HANDS of FFFF 1111 66 7777. I should have taken a hint about my lucky streak and played the lottery that night! As always, it was wonderful to be with the fabulous OMs and a great time was had by all! 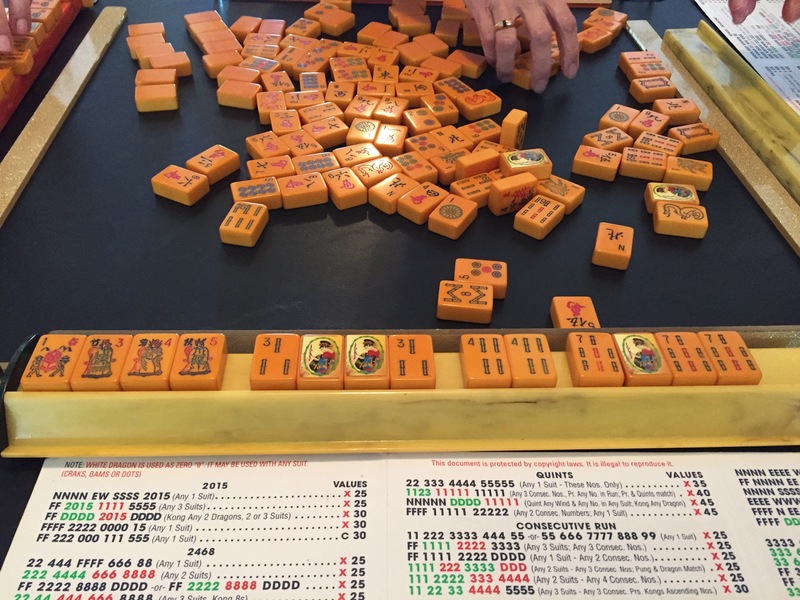 This entry was posted in Mah Jongg and Me and tagged mah jong, mah jongg, mah jongg Wednesday, mahjong, NY lottery on August 7, 2015 by Mah Jongg and Me. 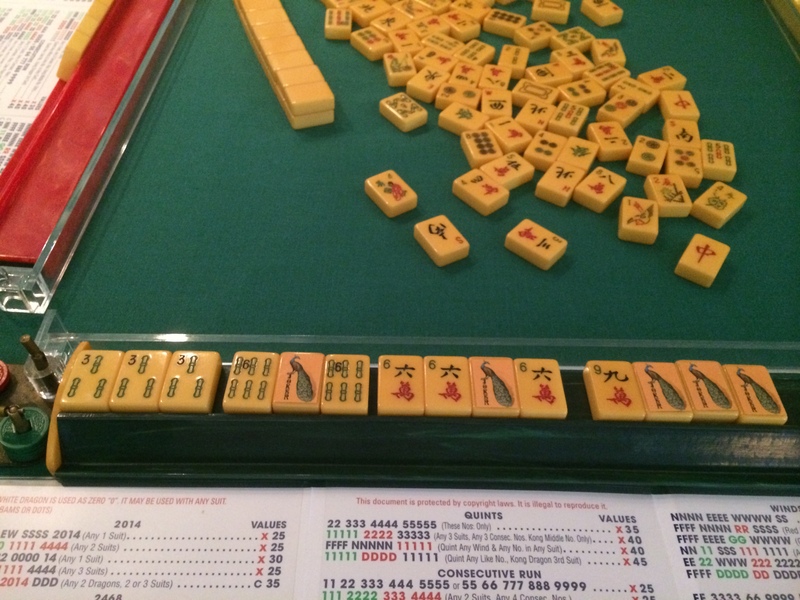 Ever since I started playing Mah Jongg, I have met the most wonderful people. 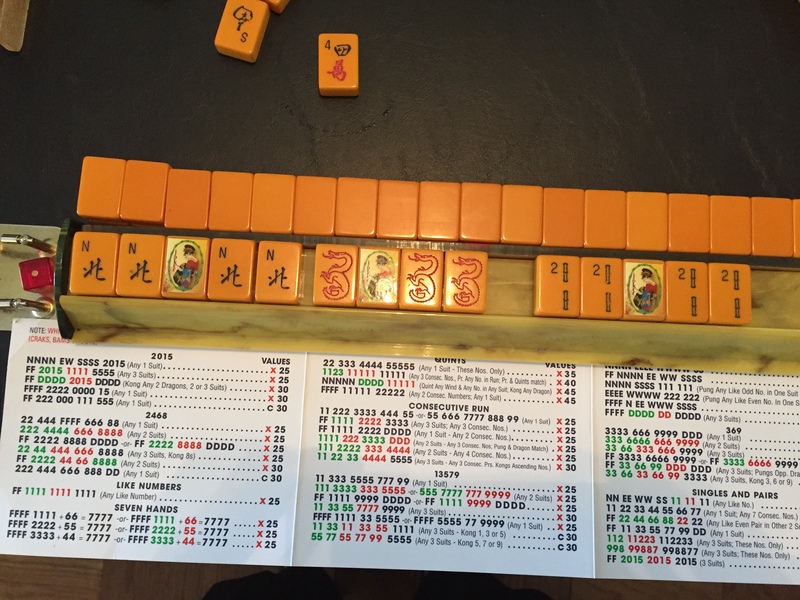 Of course, if you are a reader of this blog then you know how much I love my Wednesday Mah Jongg group, the OMs (Original Mahjettes). 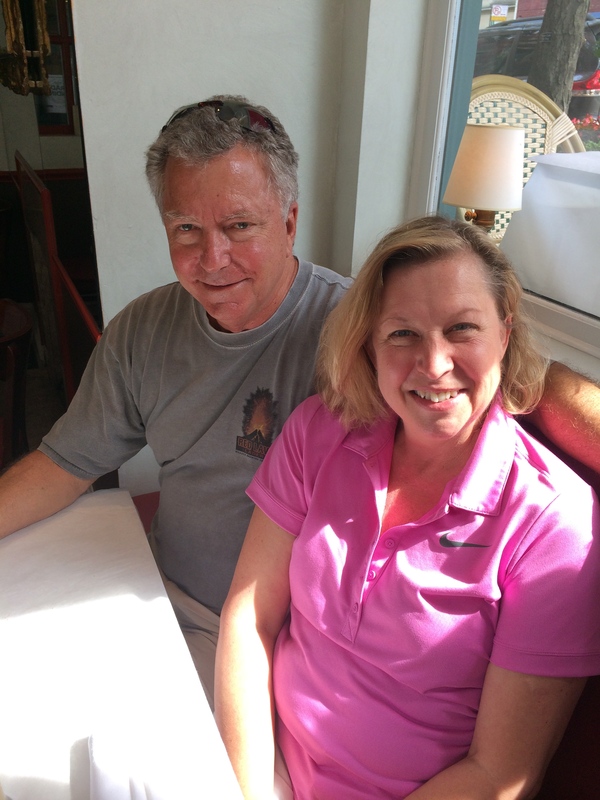 But as soon as I started writing this blog – almost a year ago! – I have met (whether in person or over the Internet) so many more truly incredible people…people I feel as if I have known for years and with the hope that our friendship will continue for years to come. Dear Ann, Please accept this small gift as a thank-you for your fabulous blog. 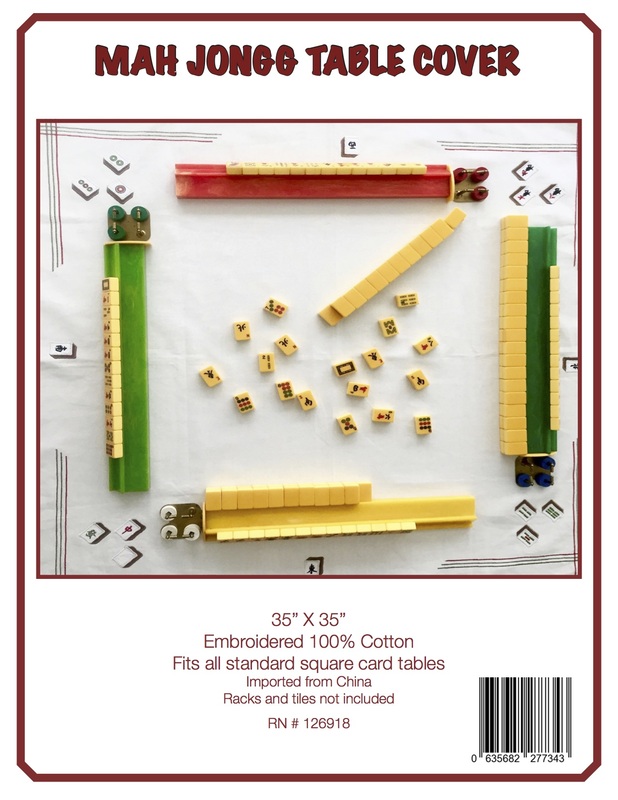 I hope it proves to be a Lucky Bamboo pusher for you during your Mah Jongg games. Wishing you all the best with your new book! Your Mah Jongg friend, Joy Hamilton. I wish you could see this in person because this picture does not do it justice. It is really a work of art and, as I said in the heading of this posting, I am so lucky…lucky to have all of you out there supporting this blog and sending me your kind words and thoughts, not to mention this fabulous gift! 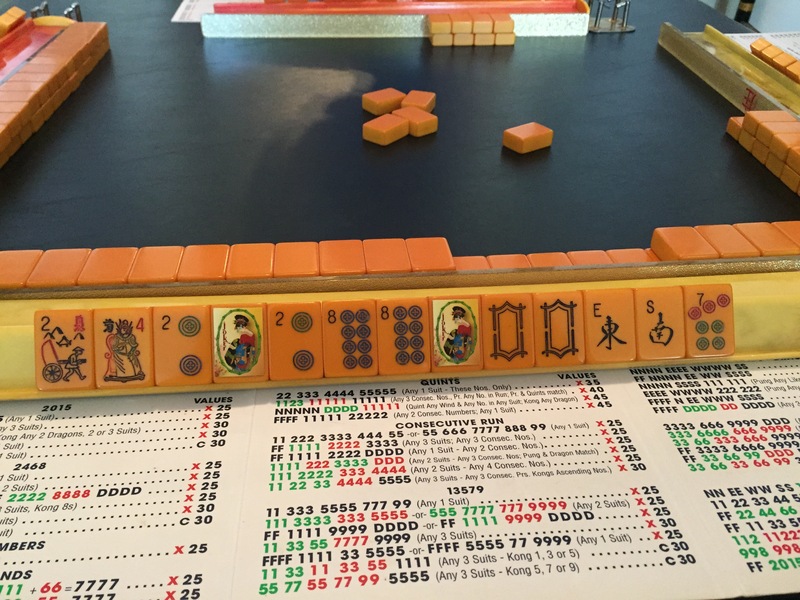 This entry was posted in Mah Jongg and Me and tagged bamboo, helping hand, mah jongg, mah jongg Wednesday, oms, pusher, stay calm and play mah jongg on August 18, 2014 by Mah Jongg and Me. 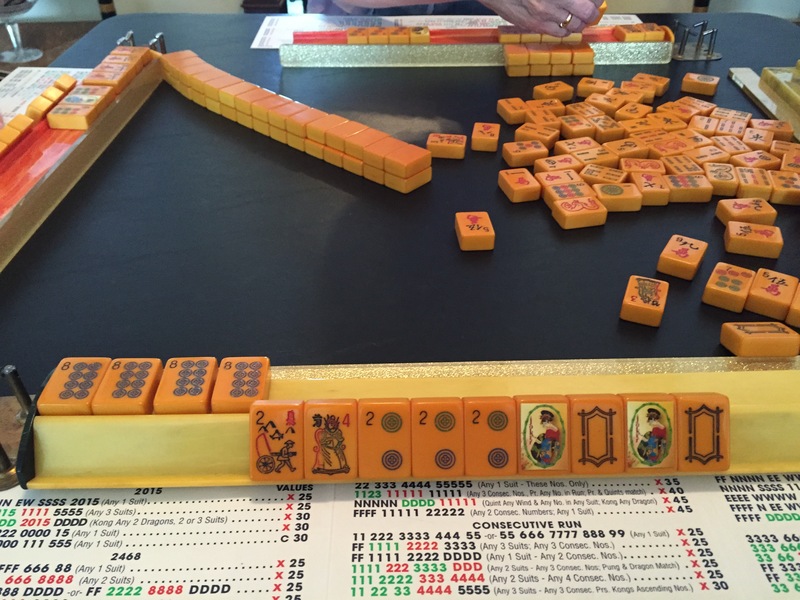 A NEW BFF – THANKS TO MAH JONGG! I have repeatedly said that Mah Jongg people are the best people and today I was proven right once again. 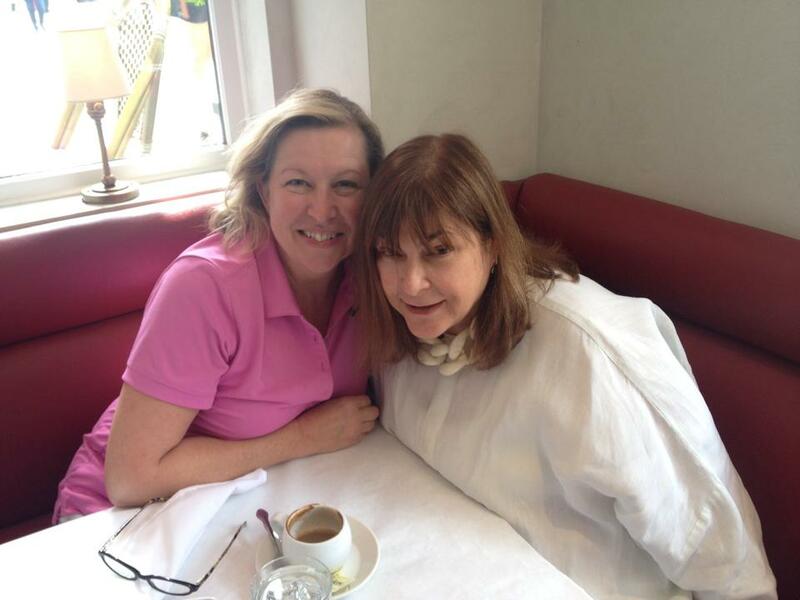 The woman I call the “incomparable Mah Jongg teacher, Johni Levene” was in town and we met for lunch (along with her fabulous husband, David). Three hours later we parted company, only to make plans to see one another again on Wednesday, hopefully for Johni to join the OMs for our Mah Jongg Wednesday game. Ever meet someone and just click? Isn’t that the best feeling ever? What a cute couple, right?!!! This entry was posted in Mah Jongg and Me and tagged mah jongg, mah jongg Wednesday, oms on August 12, 2014 by Mah Jongg and Me. 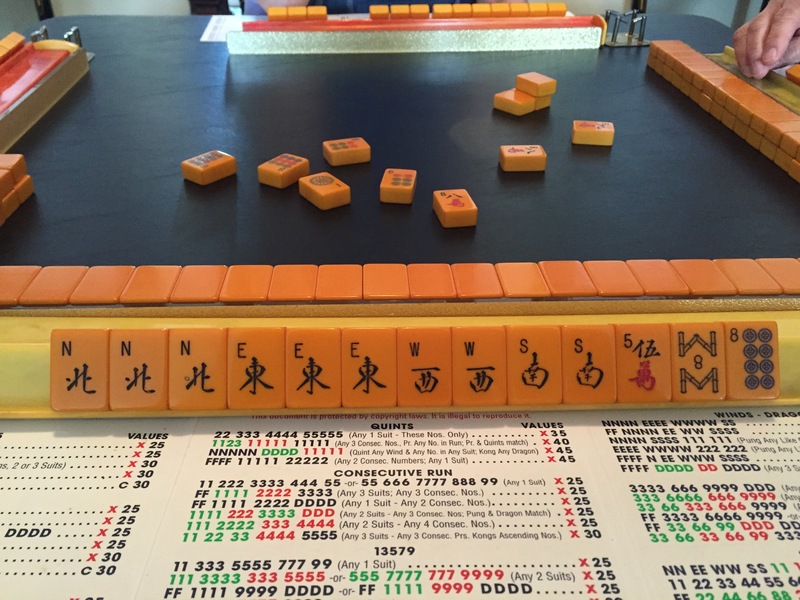 Today is Mah Jongg Wednesday for the OMs and it is my turn to host. I have a fun menu – Gazpacho, Steak Salad with Horseradish Dressing and Pickled Red Onions, and Triple Berry Pavlova for dessert – and we are going to celebrate K’s upcoming birthday. 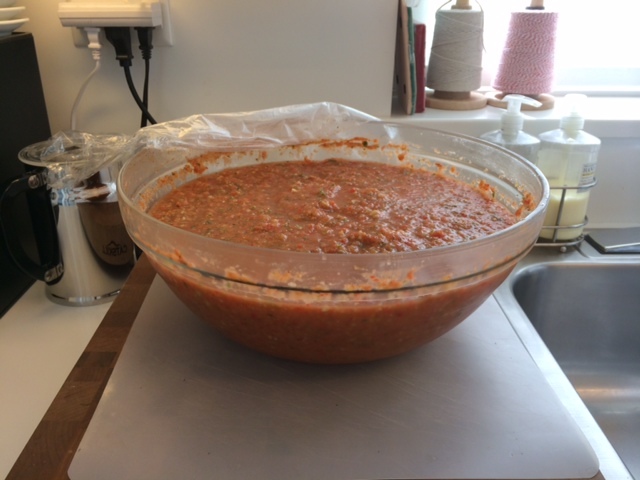 I know she loves gazpacho and so I made a huge batch of it yesterday (but forgot to take pictures while I was making it – and you should have seen my kitchen – chopped vegetables and the juice of the fresh tomatoes everywhere!). I like a chunky style gazpacho but you could use an immersion blender to make it really smooth if you prefer it that way. This entry was posted in Mah Jongg and Me and tagged gazpacho, horseradish dressing, mah jongg, mah jongg Wednesday, mixed berry pavlova, oms, pickled red onions, steak salad, triple raspberry sauce on May 28, 2014 by Mah Jongg and Me. Yesterday, being Mah Jongg Wednesday for the OMs, we met once again at K’s home. 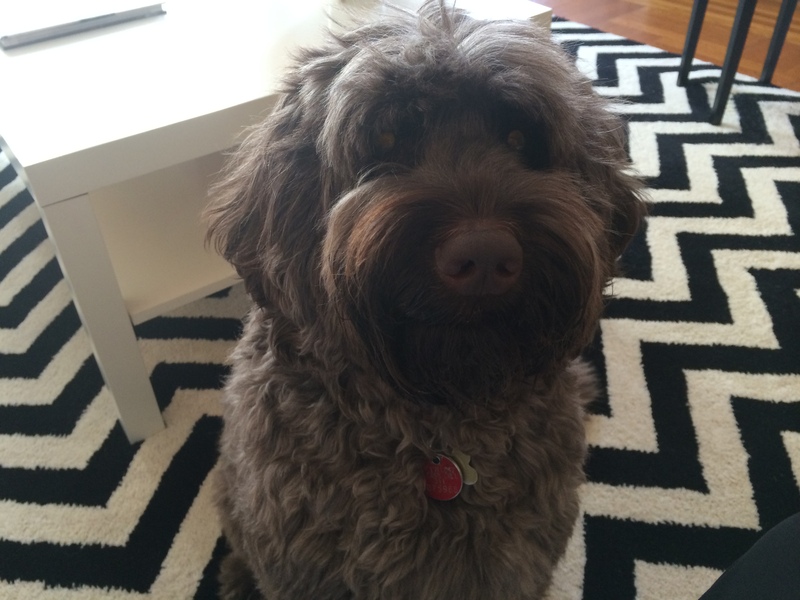 And, as always, Roxie was so happy to see all of us. This entry was posted in Mah Jongg and Me and tagged avocado and tomato salad, blue cheese, chicken salad, gazpacho, Jokers, mah jongg, mah jongg Wednesday, oms, soap, Wednesday, winds on May 15, 2014 by Mah Jongg and Me.